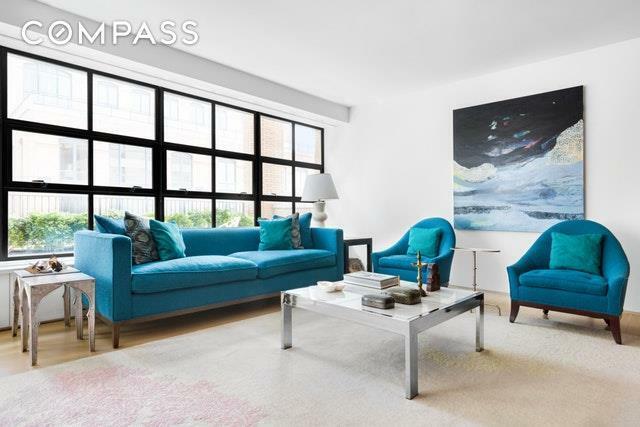 PRIME WEST VILLAGE FULLY RENOVATED DUPLEX WITH TWO LOGGIA TERRACES Rarely does a property of this scale and caliber become available in the West Village in a prime location and condominium building with a 24-hour doorman. With the equivalent space of a large townhouse, this south-facing, sun-kissed duplex with exposures in four directions and almost 60 feet of frontage onto 12th Street simply has it all. 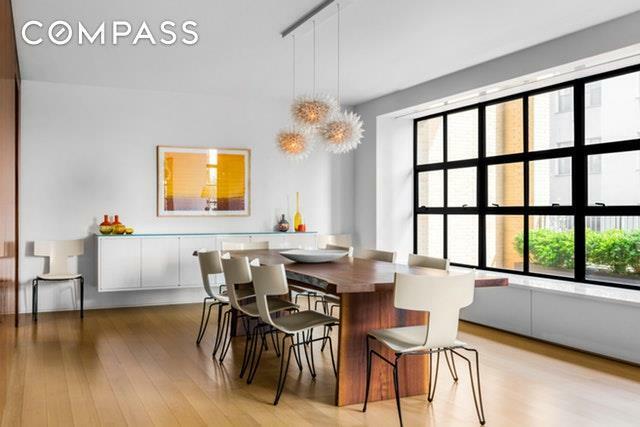 Designed by acclaimed interior architect Deborah Berke with exterior architecture by Cary Tamarkin, this carefully considered home is both aesthetically exquisite and practical. The large museum quality key-locked elevator opens directly into the apartment into an intimate foyer with a built in bench. Turn the corner to be greeted by the impressive living spaces that consist of an intimate library and a large dining room, each flanking the centered living room that boasts dramatic double height ceilings with steel casement windows. Twin loggia terraces lead off the living room, the perfect setting for entertaining on a grand scale. 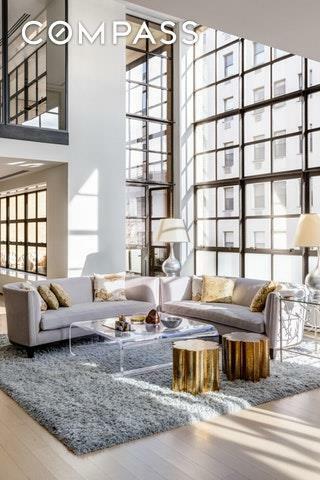 The light is superb and oblique views to the west reveal the Hudson River Park. Wide, rift-cut quarter-sawn solid oak floors feature throughout and the North wall has been beautifully milled with gleaming rosewood, including shelving in the library. Adjoining the dining room is the kitchen expertly equipped with the best appliances and cabinetry, with a casual dining area featuring windows to the East and North. A great room abuts this and leads back to the side hallway that houses a full guest suite, powder room and a mud room.A sleek stairway draws you upstairs to a study/games room that overlooks the more formal living areas. A hallway leads to the Master Bedroom with twin walk-in closets and a light-filled en-suite bathroom, beautifully appointed in a classic contemporary style. The suite also features a study or dressing rooms. Two additional bedroom suites and a large laundry room complete this floor that is also accessible via the elevator. The entire apartment has been superbly detailed and engineered to the most exacting standards and includes ducted central cooling, heating and humidification as well as full automation and AV systems, as is to be expected. 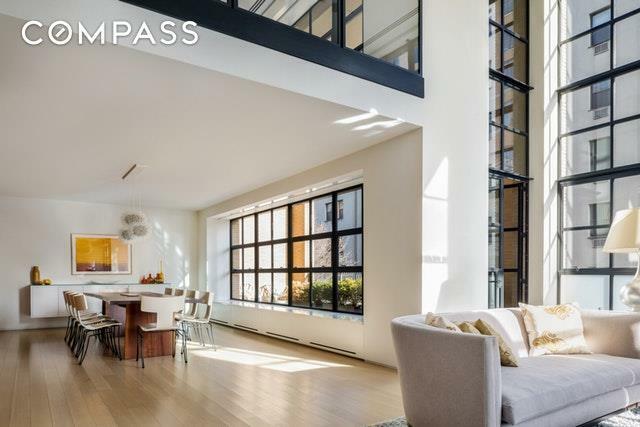 The building is located in the prime West Village, moments from the Hudson River Park, The Highline Park, the New Whitney Museum, the Meatpacking District and all things wonderful about the Village with its unique mix of retail, restaurants and entertainment. A 24-hour doorman and additional storage are included. Across the street is an A-grade parking facility. This is the best of all worlds: apartment living, with loft-like room features and the privacy mostly found in a townhouse.